Damson and Co is a British restaurant that showcases locally sourced produce. They also an impressive selection of fish and shellfish dishes that are complemented by quality English wines. 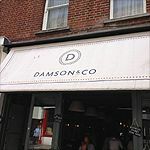 Do you work at Damson and Co? What did you think of Damson and Co? The British are certainly not known for sharing their food. Whilst the Spanish and Italians have gone centuries dining on light bites in tapas bars or Venetian bacaris, us Brits have stuck to meat and three veg on plates piled high. Damson & Co, a new deli and coffee shop in central London, is attempting to show us how to do it properly, and what’s more, doing so with locally sourced produce. The small deli is nestled in the heart of Soho, on Brewer Street. Having opened only earlier this month, it’s a perfect site for a first venture; they have some serious foodie neighbours including the legendary Lina Stores directly opposite. Arriving on a balmy July evening it's refreshing to see people being seated without a reservation; “hurrah” you may shout giddily, though it will be a huge surprise if this continues when word gets out about the food. The small eatery only seats 20 yet the layout caters for every dining option: stools at the bar for a quick refresh; a central table for small groups; or cosy two-person booths for those in it for the long run. Rather cleverly none of the menu requires cooking, so the small prep kitchen is tucked neatly away behind the bar out of view. 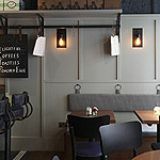 The mix of industrial tables with soft lighting and inviting upholstered booths creates a casual and relaxed atmosphere, perfect for an after work drink or light(ish) dinner. Damson & Co really does have every meal covered. 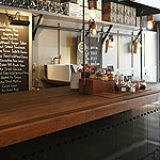 Coffee is provided by Ozone (who have been roasting in the UK since 1998) and can be sipped alongside a number of enticing breakfasts or lunches. For dinner, the menu focuses on a selection of British charcuterie and cheese; plus a small selection of tartares and Channel Fisheries plates, including oysters. The seafood menu offers a choice of three 'soused' fish with accompanying marinades. More commonly known as ceviche thanks to our South American friends, the raw sea bass (£8) is marinated in lime, yoghurt, chilli and Indian spices. The delicate slices of fish cook gently in the lime juice, firming up the meaty fish whilst retaining its beautiful flavour. The result is wonderfully zingy, the hint of Indian spice not overwhelming the fish; it' a light dish that is a perfect marriage of ingredients for a sticky summer evening. The 'house selection' board of charcuterie and cheese (£11) is the perfect way to taste the best of the British produce on the menu; the medley is presented alongside wafer thin crackers, toast, piccalilli, and of course, a damson chutney. The entire board is a fantastic assault on the taste buds and really does prove that you don’t need to turn to Europe for a great slice of wafer thin meat or chunk of cheese. The Oxspring air-dried ham puts many a slice of much-loved Parma to shame, whilst the Shorrock Lancashire Bomb cheese is smooth and delightfully creamy. The surprise of the evening, the air-dried mutton, proves why it is worth letting the chef do the choosing. It could easily be ignored next to so many well-known choices on the menu - something that would be a huge shame given that it is absolutely delicious. A very good slice of carrot cake for dessert is part of a number of baked goods delivered at sunrise from a local bakery, ensuring we can all have our cake and eat it. The same ethos of local sourcing has been applied to the beverages, whether alcoholic or not. All white and sparkling wines are English, as are the lighter reds, whilst the wittily named 'Brits Abroad' selection offers a few slightly more fuller-bodied reds so as not to disappoint those looking for a heavier number. As to toast the birth of the new Royal, it seems rather apt to enjoy the very same white wine served at Will and Kate’s wedding. The Chapel Down winery in Kent was established over 30 years ago, and with almost twenty bottles in the range, is the largest winery in the UK. The Flint Dry (£7 a glass) is described as aromatic and lively - and is just that. Another worthy mention, the Danebury Vineyards Reserve from Hampshire (£7.50), is a complex blend of four grapes, yet smooth and mellow. Damson & Co most certainly proves that you don’t have to step over the pond for brilliant produce - there's plenty here that can more than compete with our European comrades.